Enameled cast iron fondue pot; rests on rechaud / stand or can be used at stove top. 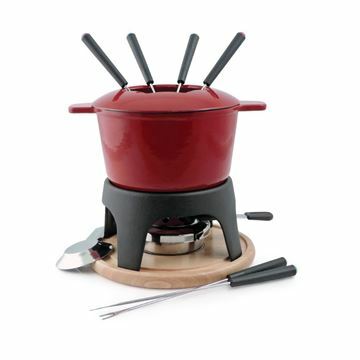 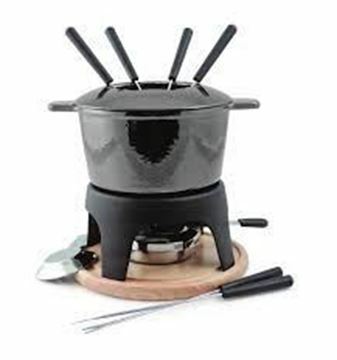 9-piece fondue set from Swissmar. 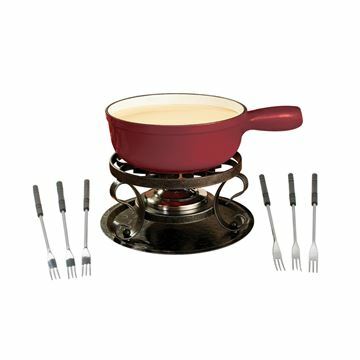 Enameled cast iron fondue pot; rests on rechaud/stand or can be used at stovetop. 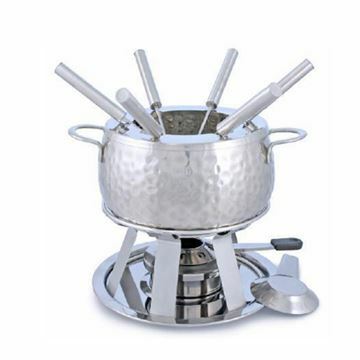 F66417 This beautiful stainless steel multi purpose fondue set has a ceramic insert that acts as a double boiler, so you can use one fondue for 3 different types of fondue - meat, cheese and chocolate. 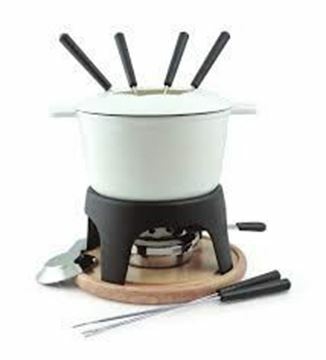 Includes stainless pot, spatter guard & rechaud, white ceramic insert, six fondue forks and fondue burner. 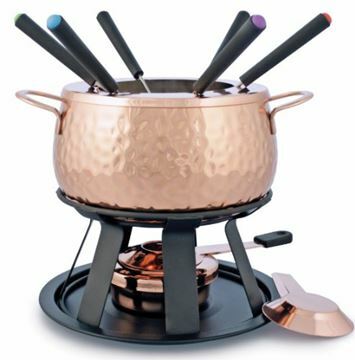 F66415, This beautiful copper and stainless multi purpose fondue set has a ceramic insert that acts as a double boiler, so you can use one fondue for 3 different types of fondue - meat, cheese and chocolate. 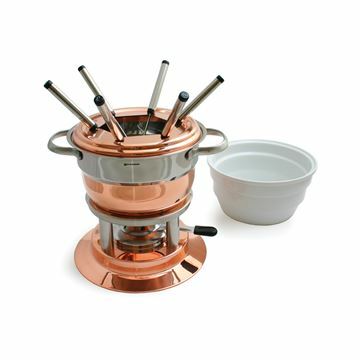 F66917, Get the party started with the Swissmar Bienne 11 pc. 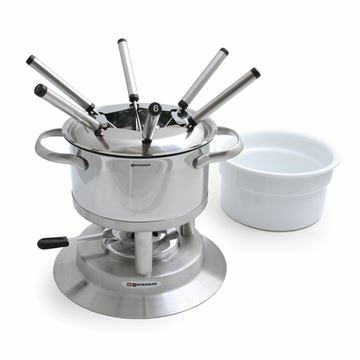 Stainless Steel Fondue Set. 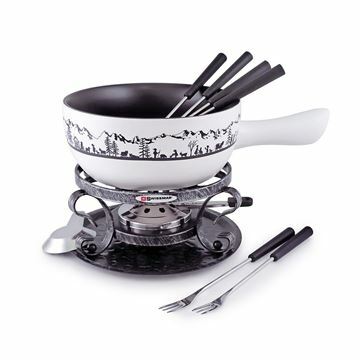 Crafted of stainless steel, this fondue set is a beautiful, versatile addition to any kitchen. 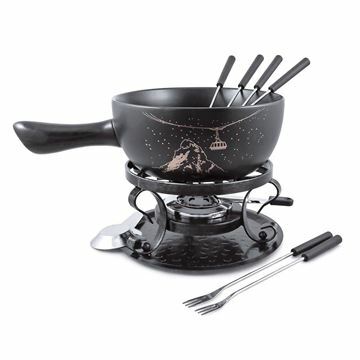 F66915, 11 Piece set includes 2 quart fondue pot, splatter guard, 6 forks, rechaud, Copper fondue burner!! 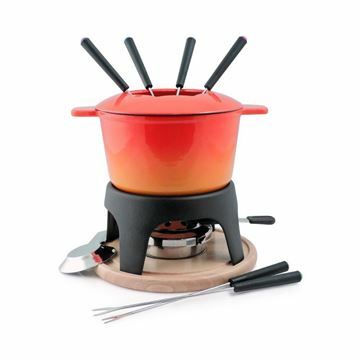 and recipe card.